From the expanding stable of Spanish producer Javier Limon’s circle of musical friends comes a new offering from singer Buika. This time, she has teamed up with Cuban pianist Chucho Valdes for a new album El Ultimo Trago. Javier, who is originally a flamenco guitarist, gets to play as well as produce on Yasmin Levy’s fourth album Sentir. Although an Italian by birth, Gino Bordin became a leading Hawaiian guitar player in France of the 1930s – and his frequent radio broadcasts accounted for a substantial part of his fame, particularly in his early days. More guitar sounds but of an entirely different variety appear on Japanese producer Makoto Kubota’s latest instalment of his Blue Asia project, this time incorporating traditional music from the island of Okinawa. 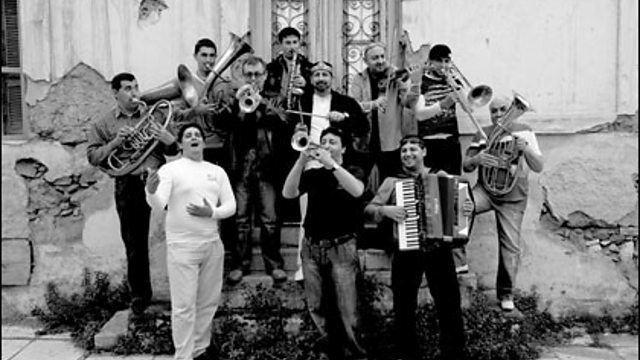 A couple of collaborations end this programme: qawwali vocalist Faiz Ali Faiz joins forces with tireless world music explorer Titi Robin; and a recent CD from Mahala Rai Banda (pictured below), a group of highly exuberant Romanian musicians, combines gypsy violins with ex-army brass players. Virtuoso de la Guitare Hawaiienne.